Unless Markelle Fultz becomes a much better player this offseason, the Sixers have few ways of improving this upcoming season. On paper, the 76ers are the biggest losers in the trade of Kawhi Leonard to the Toronto Raptors. That's because the Sixers haven't improved this offseason – on paper. You never know. If Markelle Fultz comes back and somehow plays close to an NBA all-star level, then and only then are the Sixers better. But on paper, the Sixers have not improved. In fact, they are probably weaker than they were at the conclusion of last season because of losing Marco Belinelli and Ersan Ilyasova. George signed a four-year, $137 million deal to return to the Oklahoma City Thunder. Strike one. Then on Wednesday, the Raptors received Leonard and Danny Green in exchange for DeMar DeRozan, Jakob Poeltl and a top-20-protected 2019 first-round pick. Strikeout. As a result, Toronto is arguably the conference's second-best team behind the Boston Celtics heading into this season. The Sixers, who failed to make any upgrades and lost Leonard to a rival, dropped from second to third after the Raptors-Spurs trade. And they might have to hold off the Indiana Pacers, Washington Wizards, and Milwaukee Bucks, who all made offseason upgrades. Markelle Fultz’s improving his shot is the Sixers’ only hope of having an improved roster heading into next season. "I'm here to win a championship," Brown said. "We are star-hunting … [and] you need assets to trade for a star. That unprotected pick is gold." 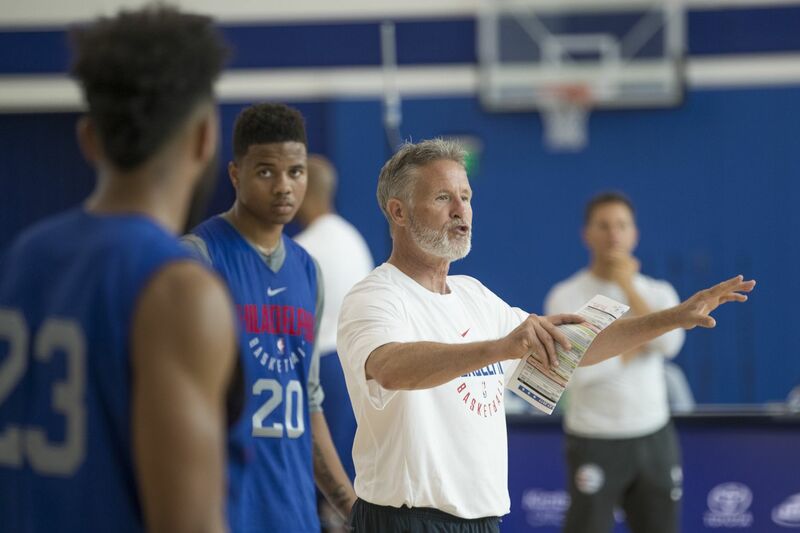 Brett Brown’s star-hunting mission hasn’t gone according to plan so far. The same day that Leonard was traded, news broke that Bjelica, who spurned the Sixers, will discuss a free-agent deal with the Sacramento Kings. That's why – on paper – the Sixers are the biggest losers in Leonard being traded to the Raptors.